The Stratolaunch Systems Corporation successfully completed the first flight of the world's largest plane ever built on earth. Founded by late the Microsoft co-founder Paul G. Allen, the gigantic six-engine mega jet with a wingspan greater than the length of an American football field is called the 'Stratolaunch'. The Stratolaunch took flight at the Mojave Air &amp; Space Port, achieving the speed of 189 miles per hour, the plane remained for 2.5 hours up in the sky to up to 17,000 feet. 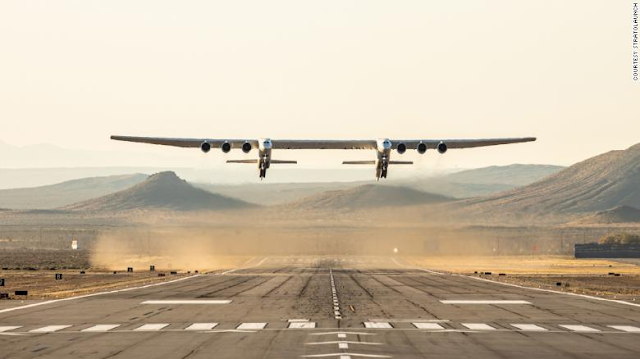 According to Stratolaunch System CEO Jean Floyd, the world has seen a glimpse of the future when the aircraft had its first test flight because of the fact that it would not be used as a regular aircraft that will fly people from one place to another. Stratolaunch was designed to a new kind of experience that offers an airlines-style access to space that is convenient and affordable.